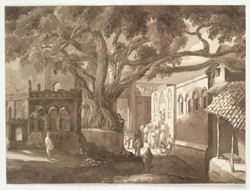 Sepia wash drawing of Gaya in Bihar, north-eastern India by Harriot Mary Woodcock (b. 1807) in 1831. The drawing is inscribed: 'HMW. 1831' and on the reverse: 'Lal Durwaza Gya. Janry. 1831'. Gaya is a significant pilgrimage centre for Hindu’s who come here to honour their parents a year after death by offering pind, a gift of funeral cakes. According to legend, a demon called Gaya, appalled by the sorrow caused by death died for the world as a protest. Vishnu was so impressed with this sacrifice that he bestowed upon Gaya the power to absolve sinners. The town has many sacred shrines which attract Hindu travellers at Pitrapaksh Tarpan in September to October when pilgrims offer prayers for the dead before taking a dip in the holy river Phalgu.